Recurrent corneal erosion (RCE) is a painful condition that affects many patients. While conservative treatment is effective for some, many struggle with painful and recurring episodes that are visually debilitating. Additionally, the pain and unpredictability can cause anxiety for those who suffer from RCE. Optometric physicians are well-positioned to provide effective long term management for most cases of this chronic condition. When necessary, surgical solutions may also be helpful. RCE can occur spontaneously or from corneal injury that penetrates Bowman’s layer, the most anterior portion of the corneal stroma. It is more frequent in diabetics and those with epithelial (or anterior) basement membrane corneal dystrophy (EBMD or ABMD). When properly treated, traumatic etiologies exhibit better prognosis for full recovery than do spontaneous forms. To illustrate how the different treatment techniques work, it is helpful to understand normal corneal healing vs. abnormal healing with RCE. Corneal healing begins when epithelial basal cells replicate to fill in epithelial defects. This initial step usually takes 24-48 hours. Basal cells bond the epithelium to the deeper stroma in 2 ways. They secrete a new basement membrane, which is the thin fibrous layer between the epithelium and stroma. They contain hemidesmosomes which act as linchpins, connecting the posterior surface of the basal cells through the basement membrane to the anterior stroma with an anchoring fibril. If the basement membrane is penetrated from injury or disease, it may become folded, split, or reduplicated. Basal epithelial cells then attach to an abnormally loose basement membrane. This disruption makes the eye more prone to RCE. Recurrences are common because basal epithelial cells require 8-12 weeks to regenerate or repair the epithelial basement membrane. Without firm attachment to the deeper layers, the regenerated epithelium is vulnerable to repeated erosion. These episodes are common upon awakening. 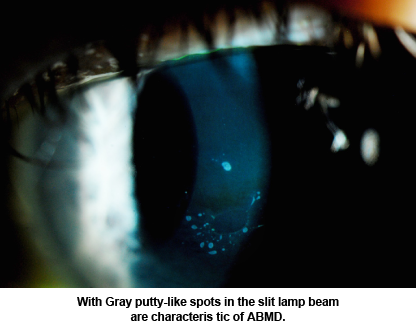 Epithelial edema and thinner tear film during sleep causes corneal epithelium to be less adherent and unable to withstand the shearing force of a blinking eyelid. RCE from injury is the result of inadequate healing of the basement membrane. Since sharp injuries such as a linear paper cut do not have the ragged edges of a more typical abrasion, the new epithelium is less likely to stick to the underlying basement membrane. Abnormal basement membrane is characteristic of epithelial basement membrane dystrophy—which is a frequent cause of RCE. Whether by injury or disease, there is a separation of the anchoring system of the epithelial basement membrane. Patients with RCE exhibit both normal and degenerate polymorphonuclear lymphocytes (PMNs) in the epithelial cells and the anchoring layer. It is thought that these degenerate PMNs secrete metalloproteinase, an enzyme that splits Bowman’s layer below the anchoring system, thereby continuing the cycle of epithelial erosion. Bandage contact lenses (BCLs) have essentially replaced pressure patching in RCE management. A thin, low-water content, disposable lens works well with an acute epithelial defect. Use a topical antibiotic, such as a flouroquinolone, to prevent infection. The lens facilitates drug delivery, reduces pain, and protects the healing epithelium from the shearing force of a blinking eyelid. If the corneal epithelium is not healing properly within 1-2 days, debridement of any redundant epithelium may provide a smooth surface for new epithelium to attach. This is beneficial when large areas of loose epithelium can be identified. Apply a topical anesthetic and use a sterile cotton-tipped applicator or foreign body spud to gently remove the loose epithelium. Topical antibiotics and topical steroids are commonly used for the first few weeks after treatment. Once new, healthy epithelium is re-established, the ongoing use of artificial tears and a hyperosmotic solution should be used for 2-3 months. After the epithelial defect has closed, continued use of an extended-wear BCL can control epithelial hydration, maintain comfort and minimize the mechanical force of the eyelid. Silicone hydrogel lenses must be used continuously for 8-12 weeks for adequate repair of the basement membrane. The contact lens should be replaced every 3-4 weeks, but be sure it is hydrated and mobile prior to removal. 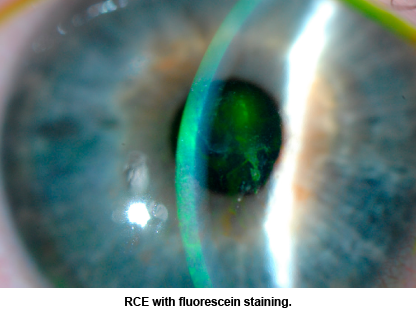 This approach requires patient education on the increased risk of infection with extended-wear contact lenses. Combination therapy involving BCLs and medication is typically used after lubricants and traditional therapy have failed. RCE patients who resist healing have increased levels of matrix metalloproteinase (MMP) enzymes. These enzymes dissolve the basement membrane and split the anchoring fibrils of the hemidesmosomes. This leads to separation of the epithelium. After instilling a topical anesthetic, the tip of a small gauge needle (27-30g) is inserted approximately 0.1 mm through the epithelium and Bowman’s membrane and into the anterior stroma. These micropunctures create small areas of scar tissue that attach the epithelium to the stroma like spot welding. Because some scarring is inevitable, this treatment should be reserved for erosions outside the central 3mm optical zone. The procedure is done by hand at a slit lamp using a 5 mm round, diamond dust burr. It is the same instrument used to polish the cornea after pterygium surgery. This technique is particularly useful when the epithelium exhibits carpet wrinkling and stromal puncture has failed. Superficial PTK has been shown to be effective in 90% of unresolving cases. The epithelium is debrided in the involved area and the excimer laser is applied to remove 4-5 microns of Bowman’s layer. The objective is to remove enough of Bowman’s layer to promote formation of a new basement membrane. The ablated anterior stromal surface highly supports stable re-epithelialization. 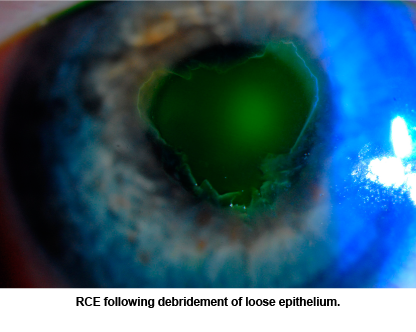 Because no optical effect occurs with such a superficial ablation, the treatment may be applied to the central or peripheral cornea. Of course, treatment must be centered if any refractive error is to be addressed. Each of these surgeries requires topical antibiotic and topical steroid post-operatively. Topical and or oral pain management are also indicated. As always, my PCLI colleagues and I are happy to assist you any way we can.